You are currently browsing the tag archive for the ‘right to fair trial’ tag. On n/a, Ms. Fernandez was informed by a notice of December 15th 2006 that she was suspected of speeding at n/a on the road n/a in n/a on September 13th 2006 at n/a (art. R413-14 of the road code). On n/a, she had to deposit €180 to get her non-guilty plea registered by the prosecutor (art.530 of the code of penal procedure). On January 7th 2008, the applicant appeared in court without being able to get access to the prosecution file of evidence of her case. She was not assisted by a lawyer and wasn’t informed when the judgment will be given (art.462 of the code of penal procedure). On n/a, the judge found her guilty of n/a and condemned her to a fine of €135, to administrative cost of €22. Following the condemnation, she automatically lost 1 point out of her 12 points driving license. On February 18th 2008, she filed an appeal to the supreme court (Cour de cassation) against the judgement. On May 3rd 2010, she was informed that on September 17th 2008 the supreme court ruled her appeal inadmissible (art.605 of the code of penal procedure) for a violation of article 568 of the code of penal. On October 29th 2010, she filed an application to the ECHR on the ground that the lack of access to the prosecution file of evidence was a violation of article 6-1 of the Convention. She added that the lack of formal notification of the judgment of Montpellier was a violation of article 6-1 and 13, and that the requirement to file in person her appeal to the supreme court, was a violation of article 6,13 and 14 of the Convention. She stated that the prosecutor was not required to file in person his appeal. On January 17th 2012, the 5th section of the Court ruled her application inadmissible on the surprising ground that because the administrative judge Fernandez was condemned to a fine of €135, “the applicant has not suffered significant disadvantage regarding her right to a fair trial” (art.35-3-b) of the Convention). On October 6th 2011, the 5th section of the Court ruled in judgment Wagner v. Luxembourg (43490/08) that the allegation of violation of article 6-1 during proceedings following which the applicant lost 4 points out of his 12 points driving license, was admissible (§25). 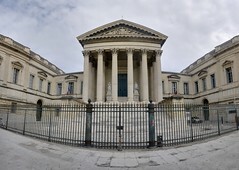 On March 18th 1997, the Court found in judgment Foucher v. France (22209/93) that the lack of access of the accused to the prosecution file of evidence was a violation of article 6-1 and 6-3 of the Convention. In this case, Mr. Foucher was condemned to a fine of €457 for insults.